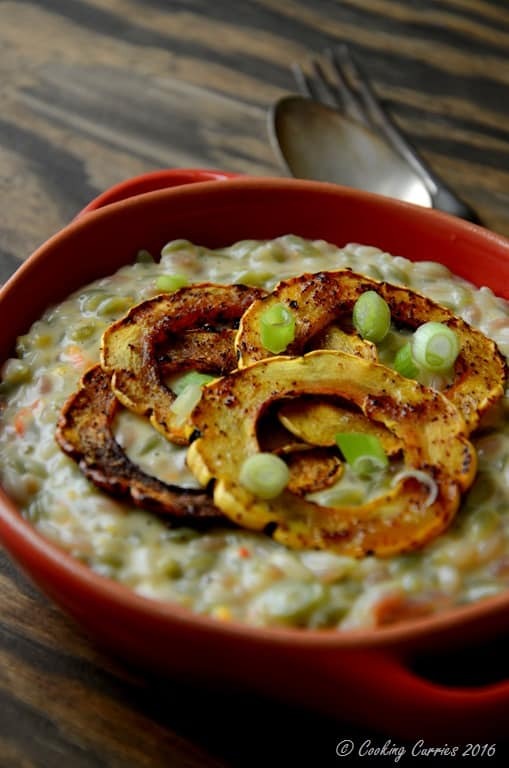 Rainbow Orzo in a creamy garlic sweet pepper gruyere sauce topped with ancho chile roasted delicata squash is a thing of beauty that is bursting with fall flavors, to adorn your fall dinner table. 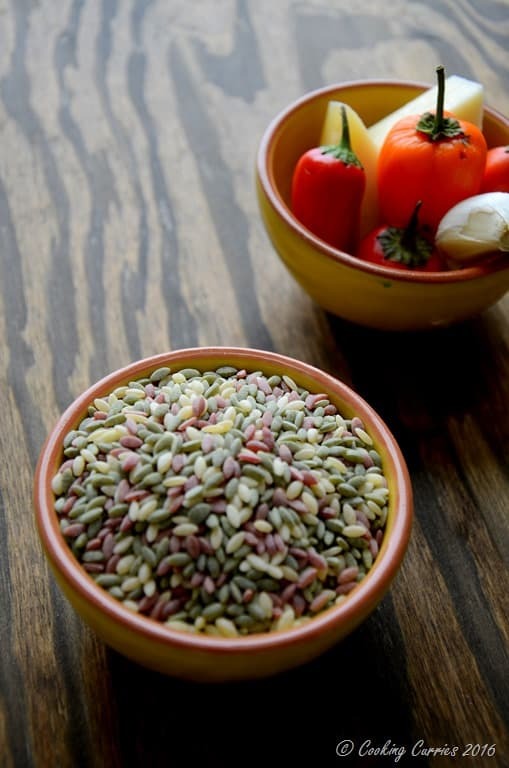 These days, I spend a lot more time at the bulk bins at Whole Foods to buy new grains and beans to try make something different for lil V. It was one such shopping trip and that is when I laid my eyes on these beautiful rainbow orzo / sunset orzo, as they call it. Its orzo made with semolina powder and they have used spinach red pepper and beet powder for the colors. I wasn’t sure what I was going to make with it. But I just had to buy it. So, I packed some in a little brown bag and threw it in my shopping cart and the rest was, well, that is what you see here. Come fall and it is the season for squash and they do come in all shapes and sizes. 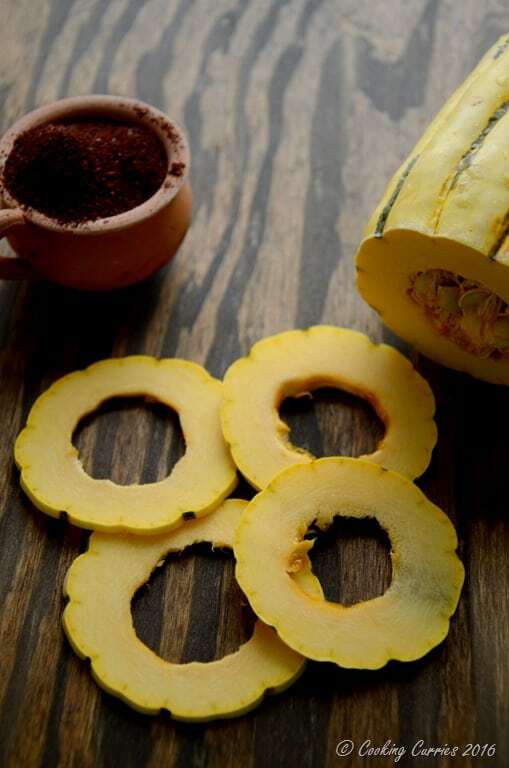 Delicata squash is one of my favorites. 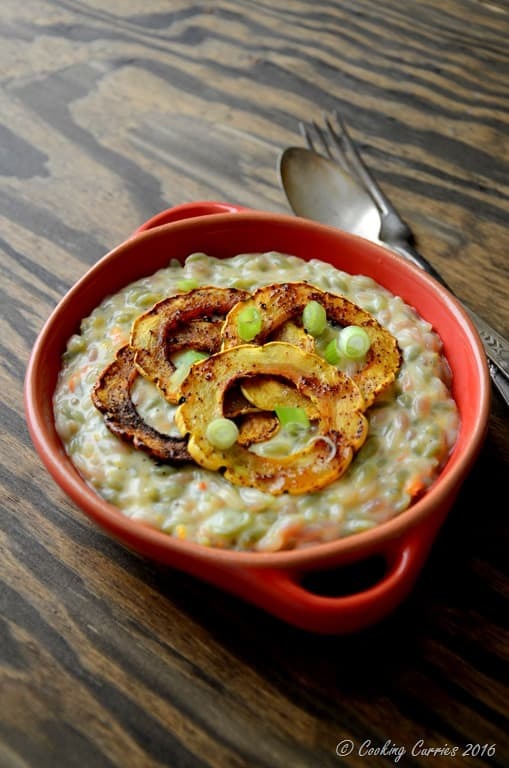 Not only does it taste super delicious, but also it is one of the squashes that is easiest to work with. Why?!? Mainly because, you don’t need to peel the skin!!! Easiest and tastiest way to cook these beauties and to get the nice natural sweetness of the squash is to simply slice them up in rings, remove any flesh or seeds that may be there in squash ring, toss some olive oil, salt, pepper and any other seasoning you want and roast in the oven. This goes really well as a side for any pasta, risotto or just as it is! Boil the water, add a little salt and cook the orzo in it. Drain and keep aside. In a pan, heat the olive oil and add the minced garlic and sweet peppers. Cook for a couple of minutes till the peppers soften. Remove from heat and keep aside. Meanwhile, preheat the oven to 350F. 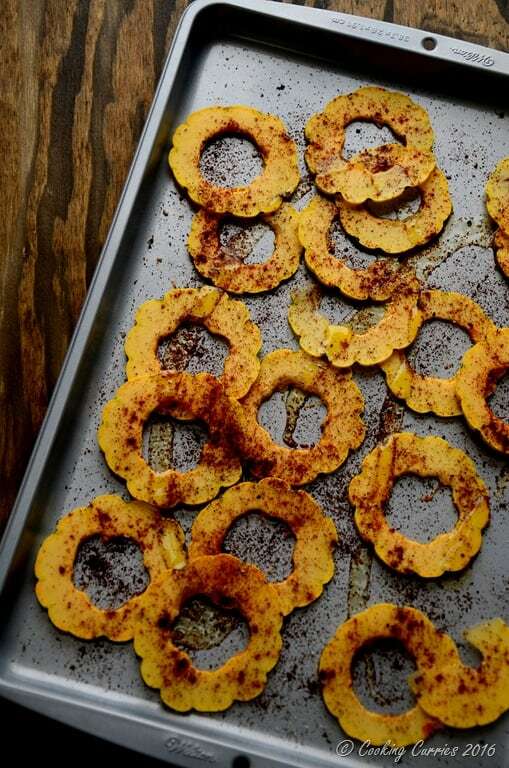 Toss the delicata squash rings in salt, pepper, olive oil and ancho chile powder and arrange on a baking tray. Bake for about 20 -30 mins, till they soften. Combine a few tablespoons of the milk to the flour and whish well, so there are no lumps. Bring the rest of the milk to a boil in a saucepan. Reduce the heat, add the flour mixture and cook for 2-3 minutes. Add salt and black pepper. Add the garlic pepper mix to this and blend in a blender till smooth. Pour the mixture back into the saucepan and cook for just 2 minutes or so. Remove from heat and add the grated Gruyere to it. Combine well. Add the orzo to this and mix well to combine. The pasta mixture will look a little runny at first, but it will gradually thicken in time. To serve, take some pasta in a bowl. 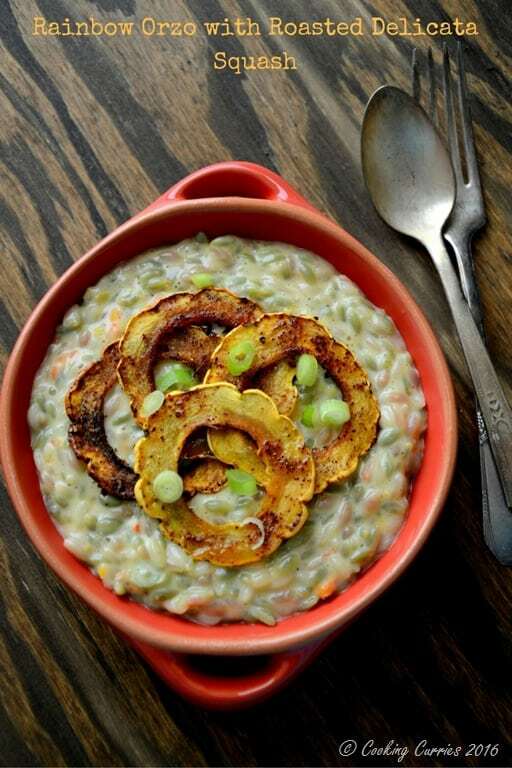 Place a few squash rings on top of it and garnish with the chopped scallions. You can add some more grated Gruyere as well. Combine a few tablespoons of the milk to the flour and whisk well, so there are no lumps. Bring the rest of the milk to a boil in a saucepan. Reduce the heat, add the flour mixture and cook for 2-3 minutes. Add salt and black pepper. Add the garlic pepper mix to this and blend in a blender till smooth. Pour the mixture back into the saucepan and cook for just 2 minutes or so.